JERUSALEM—A Hamas force wearing Israeli army uniforms emerged from a tunnel inside Israel this morning and inflicted losses on Israeli troops before being wiped out. The Hamas squad numbered at least 10 fighters, Israeli sources said. Nine were killed but an Israeli officer said at least two may have escaped through the tunnel. In initial accounts, which gave conflicting narratives, the Hamas force was said to have emerged from a hidden tunnel on the Israeli side of the border only 200 yards from a kibbutz, and split into two groups. Israeli soldiers whom one group encountered shortly afterwards reportedly took them to be fellow Israelis until it was noticed that they were carrying Kalashnikov rifles used by Hamas. An exchange of fire ensued. The other Hamas group meanwhile ambushed an Israeli army jeep, which it hit with an anti-tank grenade, killing its four occupants. Israeli aircraft attacked at least one of the Hamas teams. Israeli losses as of tonight in the four-day-old incursion were 25 dead and several score wounded. An Israeli official said the number of Hamas combatants killed amounted to "several hundred." 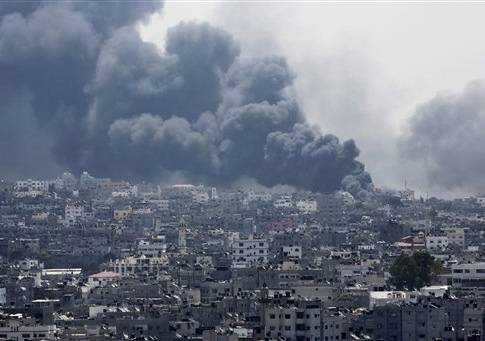 Hard fighting was continuing in Gaza as dusk fell, with artillery and air strikes pounding Hamas positions. The fighting focused on the town of Shujaiya. Located only a mile from the Israeli border, it is the source of many tunnels leading towards the border. The commander of Israel’s southern front, Gen. Sami Turgeman, told reporters afterwards that "tens" of Hamas fighters had come through the tunnel. He said that Hamas had noted the day before that Israeli aircraft had bombed an area inside the Gaza Strip where the mouth of the tunnel was located and had reason to assume Israeli ground forces would soon reach it. "They wanted to take advantage of this asset before we got there," he said. "They paid for it. … We also paid a heavy price." Meanwhile, Israel’s Channel Two reported that 20 Hamas gunmen have been killed in the past two days after they emerged from the mouths of tunnels inside the Gaza Strip. Ten of them emerged from a tunnel inside a mosque. Among them was a female suicide bomber who attempted to charge the Israeli soldiers. A senior Israeli officer in Shujaiya said yesterday that one tunnel he had examined was 27 meters deep—equivalent to a seven-story building—and was lined with at least 800 tons of reinforced concrete. He said the existence of such tunnels leading into Israel would have permitted Hamas to send commando forces at night through all of them simultaneously to wreak havoc in the Israeli villages in the area. This entry was posted in National Security and tagged Gaza, Hamas, Israel. Bookmark the permalink.